Harry, Harley and Isabella with two-day-old triplet lambs. The family started ‘from scratch’ just over a year ago, despite originally being from a farming background. Mrs Colwill said the farm is currently lambing 150 ewes, with a 169 per cent lambing percentage and 19 lambs expecting triplets. 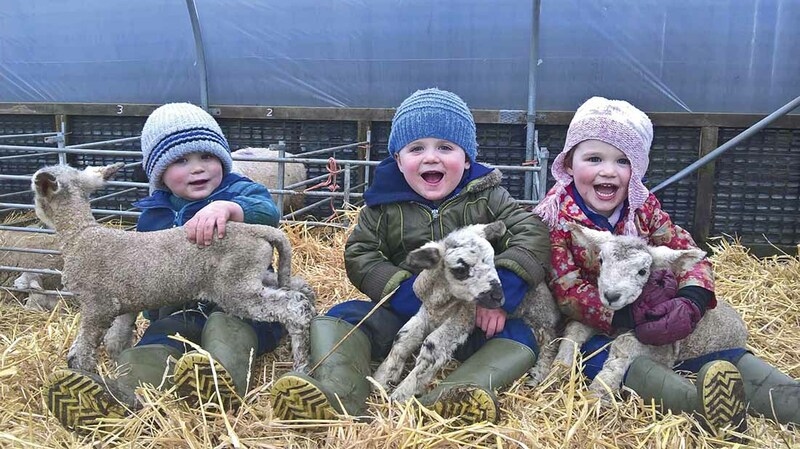 She said: “The triplets help out with water buckets, feeding the bullocks course mix, loading silage on their tractors to feed the sheep and cleaning the yard. The toddlers are on the farm most days whilst their dad works away for half the week. When he is home, it is family time on the farm. Mrs Colwill and her husband plan to sell the older Bullocks as store cattle, with calves that have arrived since September put on the ‘Buitelaar’ system they have recently signed up to. “We have been very fortunate to have been given such an opportunity,” she added.